It’s Leap Day! That rare extra day we get every 4 years – I figure that it’s fate’s way of telling me that I should spend it sewing…. just for me! 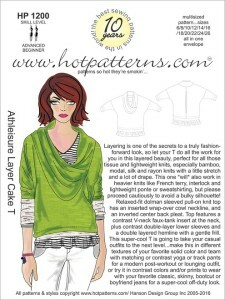 Today I decided that I am starting Hot Pattern’s Layer Cake T – I like the whole idea of this layered top, especially the faux tank under it all. The one problem I have with this look is trying to mix and match fabrics. While I love the crazy combinations that a lot of people are able to come up with, I’m not great coming up with them myself. I did manage to sift through my fabric stash and came up with 3 different fabrics that I think work together well, although it is probably a bit on the conservative side as far as mixing prints goes. My only concern is that while the gray and white fabrics have a lot of drape (and should work well for this pattern), the stripe is a lot beefier and I’m unsure how that’s going to work for the ruffle. This entry was posted in Uncategorized on February 29, 2016 by stacy. Generally, my favorite types of sewing books are those that have lots of patterns inside. However, all week I’ve found myself pouring over a book that tackles pattern making, draping, fitting, and fashion design – it’s like a sewing retreat that’s held in the comfort of your own home… and I love it! 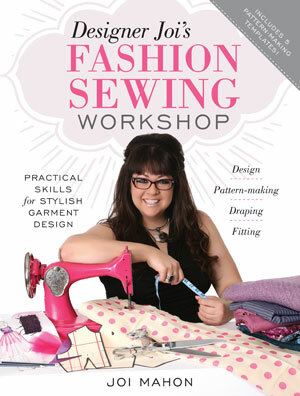 Designer Joi’s Fashion Sewing Workshop is the latest title from Joi Mahon (you might recognize the name from her popular Craftsy classes and the designer behind several McCall patterns) that tackles a bevy of topics that are essential in designing your own garments from start to finish. 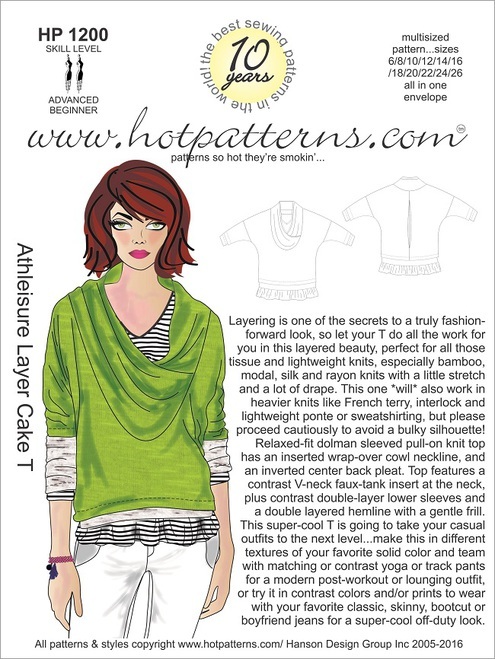 Not only will you learn how to illustrate you design, buy you’ll learn how to create a pattern, drape, and adjust your garment ideas for ‘real bodies’ (I really liked the section on ‘fitting the aging body’ because, boy is that true!). Best of all, after each section\topic there is a ‘challenge’ that helps practice the skills you just learned. Even if you’re not wanting to make your own designs, there’s lots of fantastic information that can be applied to commercial patterns – from adjusting the design to fit your measurements, learning how to rotate and combine darts, and changing the bust curve, to altering clothing for children. 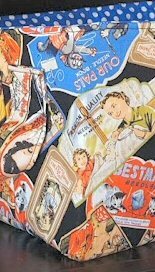 There is also a nice section on using slopers (with samples in the back) as well as a great design inspiration section full of bodice, skirt, yoke ideas and more that will help get your creative juices flowing. One thing I should point out is that while there is some discussion of skirts mentioned in this book, there are no pants. I imagine that this is a topic that could take an entire book on how to create, sew, and adjust the fit which is why I figured it isn’t touched on in the Fashion Sewing Workshop…. maybe the next book! Overall, I loved this book – I thought it had a lot of useful topics that I can refer to when drafting my own patterns or modifying existing ones. While I didn’t try out any of the design challenges, I’m anxious to give them a whirl this weekend. If you’re interested in looking more into Designer Joi’s Fashion Sewing Workshop, you can get a preview of some of the chapters over at Amazon. This entry was posted in Book Reviews on February 26, 2016 by stacy. Know a huge Star Wars fan? Make their year when you make them a Millennium Falcon purse. My favorite type of sewing… lazy girl style! Learn how to make a quick and easy Tulle Skirt. Clean up your child’s play space by making a stuffed animal chair. If you make this, let me know the comfort level of this bean bag – it seems like it might be a little lumpy. Dress up for the holidays. Whip up your son a bow tie for Easter. Decided to make a Minecraft quilt from last week’s post? 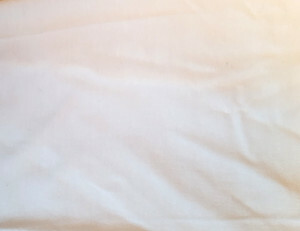 Make a few pillows to go along with it. Keep all your supplies handy when you press\iron with this handy ironing board caddy. Everybody loves a tote with lots of pockets. This 5-pocket canvas bag has lots of room for storage. A new twist on the infinity scarf trend. Make it in lace (I love this idea!). If you have trouble getting your child to wear a jacket, try sewing up one of these shark hoodies. 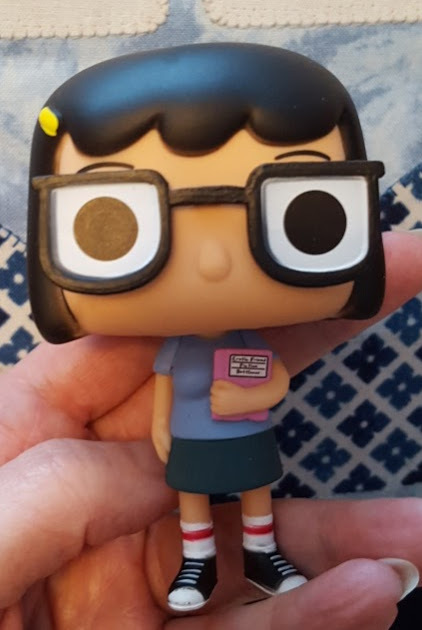 I think I need one! Planning on a trip soon? 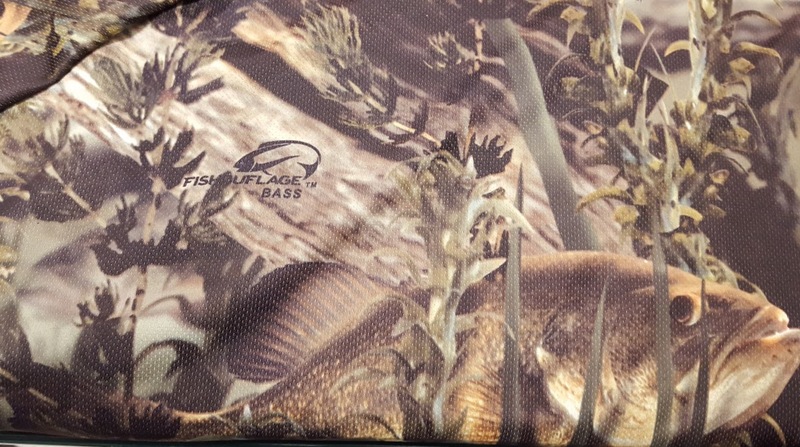 Make sure no one grabs your bag when you make a custom fabric luggage tag. Channel your boho vibe and make yourself a baby doll blouse. Love giraffes? This little ticker tape quilt is perfect for nurseries or a wall hanging for giraffes. This entry was posted in Uncategorized on February 25, 2016 by stacy. In between working the book fair at my son’s school, I’ve been writing a few new tutorials and (of course) taking in some fabric shopping. 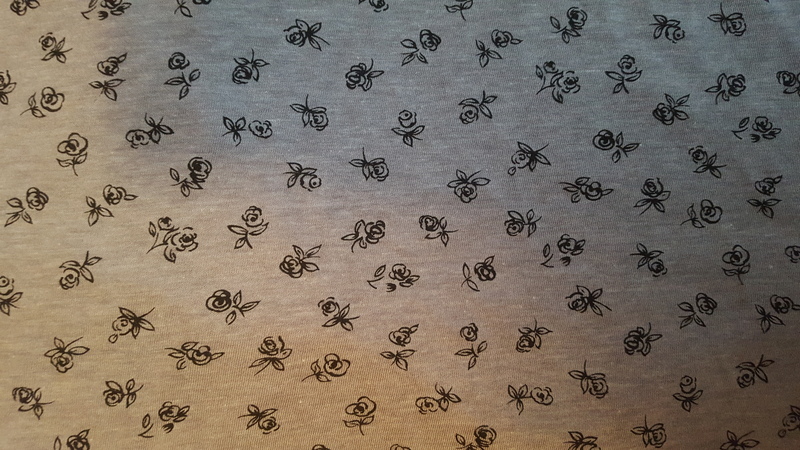 Yesterday I finished up a fun little project that I can’t wait to share… isn’t this material adorable? Once I finish writing\editing\tweaking the instructions, I have a slew of new project ideas that I hope to make progress on…. More basketball short\shirt sets. 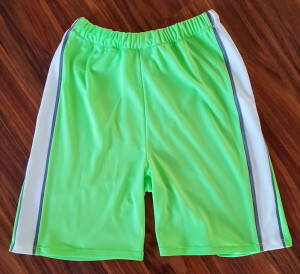 I have to admit, I really liked making these and I found some thicker material that will work for the shorts (and even some wicking fabric that wasn’t white or black!). I found this at Joann’s recently and couldn’t resist buying it for Bret & Easton (I didn’t want Taylor to feel left out so I told her I would make her one too, even though she hasn’t been fishing in ages). I am very excited to sew this up – not only is this a rare occasion that I get to sew for my husband, but this print is so funky for them that it should be fun to wear, too. This entry was posted in Uncategorized on February 24, 2016 by stacy. While all my friends know that I sew, it’s not very often that I offer to make something. However, a few weeks ago, my friend told me that she and her mother had a wedding to go to that required them to wear saris. While she ordered her ‘set’ online, her mother received her package directly from India and didn’t realize that she would need to have a top made to match the material. When we were talking about it, she described that her mother wanted a gold, fitted top with a round neck and 3/4 sleeves…. and I immediately thought of Jalie 2805 – since I knew that it doesn’t take long to sew, I offered up my services. 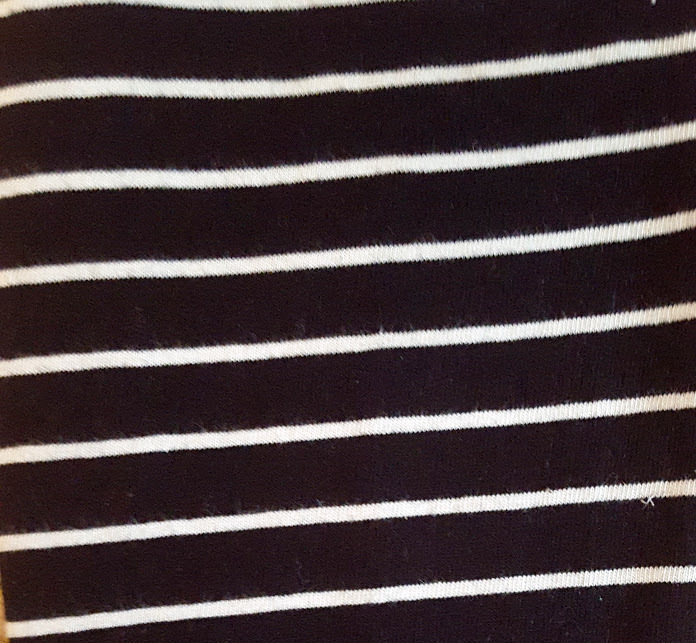 After a brief internet search for fabric, I came up with Gorgeous Fabric’s Lame Make You Smile Plisse Knit for the material. So, once it arrived, I set to work and I have to say, I am in love with it (and it matches the sari material perfectly, too). Even though her measurements were not near mine, I totally would have kept this top for myself…. I am thinking I may have to order some of this material for me. It is sheer, but with a cute (or matching) cami under it, I think it would look fabulous. I’m hoping that they send pictures from the wedding – I told her that when she is done with the sari fabric that I would totally take the sari print off her hands. I have always wanted to make Hot Pattern’s Bollywood Dress and I can totally envision making one (well, with the amount of material she had, I could probably make two) from it. OOOh, one can dream! This entry was posted in Uncategorized on February 22, 2016 by stacy. One perk to being a GoToPattern Brand Ambassador is that I have an opportunity to stitch up patterns that I might not have otherwise tried…. a great case in point is Peek-a-boo Pattern’s Hang Time Basketball Shorts. I had never given any thought to making my own shorts for Easton largely because they are so easy to buy in stores, but boy was I wrong! First off, let me say, the Hang Time Shorts were incredibly easy to sew (an advanced beginner could easily tackle this project) and they stitched up in an afternoon. 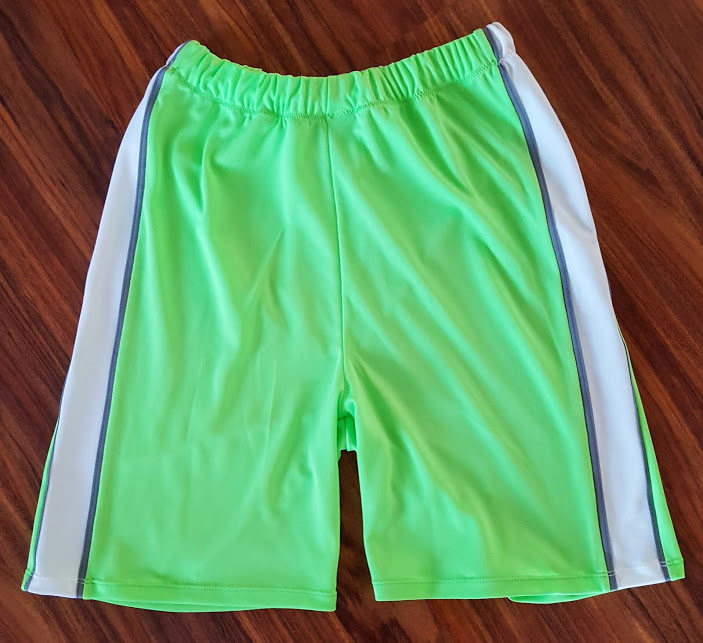 The side stripe (with the option of adding bias tape to the edges) and the drawstring elastic on the inside of the shorts (my first time using it, too) gives it a great ready-to-wear finish. As for the fit, I think it’s pretty spot on without needing to make any modifications. I sewed up the size 7/8 and found that the waist is perfect (without having to draw up the cording a bunch to make it fit), but the length is a bit longer than what he currently wears (fortunately that is an easy fix). Overall I am EXTREMELY pleased with the results. I’ve found that a lot of purchased shorts in Easton’s sizing runs a bit large so I’m frequently taking them in just a bit to make them fit more securely – sewing my own has proven to be quick and easy, with professional results, and a great fit. Best of all I was able to stitch up this entire look (including the shirt I made earlier in the week) for under $10! 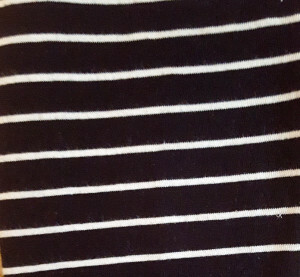 Now, I’m on the hunt for more material (this is a bit on the thin side) to make some more coordinating outfits. Anyone have suggestions for ‘basketball short’ type material? This entry was posted in Uncategorized on February 19, 2016 by stacy. With our weather this week turning remarkably spring-like (80’s tomorrow!) – I thought it might be time to tackle some of those ‘warm weather projects” that I have on my list. So, I set out to sew up a pair of shorts for Easton…. then got sidetracked and made a shirt instead! Once again I used Jalie 2918, but decided to change up the design a bit. I used a lime green (which seems to be our favorite color this year) for the sleeves and neckband, but it still looked like it needed a bit more color in the shirt (especially since it was a pretty basic white everywhere else) so I opted to add a side stripe! 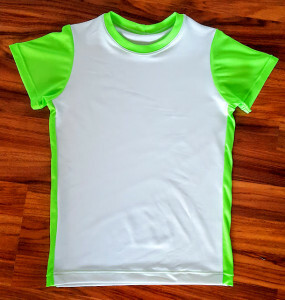 I didn’t have a lot of material to work with (otherwise, I would have added a larger band to the sides), so I added a 2″ strip to the edges of the shirt (which means that I trimmed off 3/4″ off the side edges of the front and back). When constructing the shirt (after sewing the front & back together), I attached the band to the side front, then to the side back, then inserted the sleeve. I am super pleased with the result and will definitely remember this for future projects! I’ll be sure to capture an action shot, but for now, here is the shirt “hot off the sewing machine”. This entry was posted in Uncategorized on February 17, 2016 by stacy. Last night I spent the evening…. coloring! 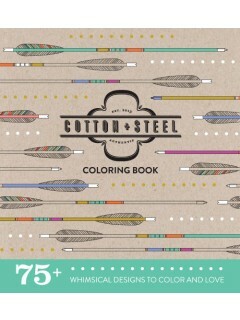 One of my favorite fabric designers has made the cross over to adult coloring books – Cotton + Steel! Their new book is filled with fun images – some with familiar themes like their popular horses, tiger, and typewriter designs and a slew of new ones: sugar skulls, snow globes, quilt and even abstract designs. There’s something for everyone inside. The best thing about this book (besides the pictures), is that the pages are perforated so you can remove them! 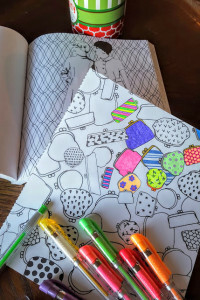 This made it so much easier to ‘get in there’ and color the illustration, plus I am thinking that if I really like what I made, I can either hang it on the fridge (with the rest of our artwork and awards) or I can stick it in a frame and rotate out the designs in my sewing room! Here’s a little preview of what I started – I went right to the purses (I almost went with the design you see behind it because their dresses looked fun to decorate)! As a side note, I also used gel pens (this set had neon, metallic, and glitter) instead of colored pencils because I’ve seen a lot of talk about how people like this medium. I think it gives you a lot less blending opportunities (and it smudges easier), but definitely has more ‘pop’. Next time, though, it’s back to the pencils! This entry was posted in Uncategorized on February 16, 2016 by stacy. New swimsuit! 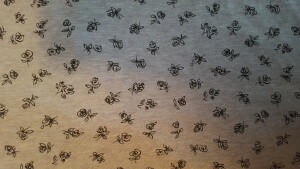 My geeky Star Wars sugar skull swimwear fabric arrived and I’m itching to make a new suit. The print is rather large so I need something that will show off the design – I’m thinking that it may need to be a tankini style, but I would love something more fun. Shorts, shorts, shorts. Basketball might be over now for Easton, but he loves wearing the shorts. If I can find a good resource for that athletic tricot mesh, I may make a bunch for summer. Jackets galore. I’ve been talking about making the Hyde Park Hoodie for ages and I’m finally getting off my duff and doing it. I also purchased some great Marvel and Adventure Time knits and would love to make hoodies for Easton. Speaking of Marvel, we’re seeing the Marvel Live tour right around Easton’s birthday and thought I would come up with a ‘surprise package’ for him to go along with the tickets. In addition to the Marvel knit, I found a coordinating woven – I’m thinking pajamas would be cool. New Patterns. As always the new patterns are trickling in and I want them all! Which ones caught your eye? I think I need some new shirts for spring! 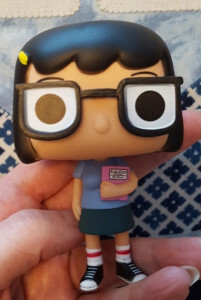 By the way, the Tina Funko Pop really has nothing to do with sewing… I got her this weekend as a gift and have added her to my collection of toys that adorn my sewing room. This entry was posted in Uncategorized on February 15, 2016 by stacy.